Hello, dear readers. It’s been a while since I’ve written one of these personal posts, and for good reason. I’ve just entered my 13th week of incubating the Wee Pixie and it’s been a hell of a journey. I have a new appreciation for my mama, and for all the mothers out there – this is not an easy job, and the hardest parts haven’t even begun! I’m blessed to have a day job that allows me to work from home, and so most of my first trimester was spent in my pajamas on the couch nearest the bathroom, with a cat and dog to guard me and keep me warm. There were some days where I could only eat goldfish crackers, green grapes, and yogurt cups. All of my healthy eating and drinking habits went out of the window! I had expected to be sipping nourishing herbal infusions and smoothies, but instead, I couldn’t even drink water most days and had to use Gatorade and protein drinks to keep from being dehydrated. When you are malnourished and dehydrated and nauseous, it is also very hard to think straight or write – but now things are improving! Now that I am feeling more centered and stable, those herbal infusions have been a pleasant addition to my life. In fact, I have a new favorite and will be making a big batch of it and sharing some for sale in the shop soon. Keep posted! Speaking of the shop, site, and my ability to think, there’s been a few new changes, and I want to make sure you saw them. 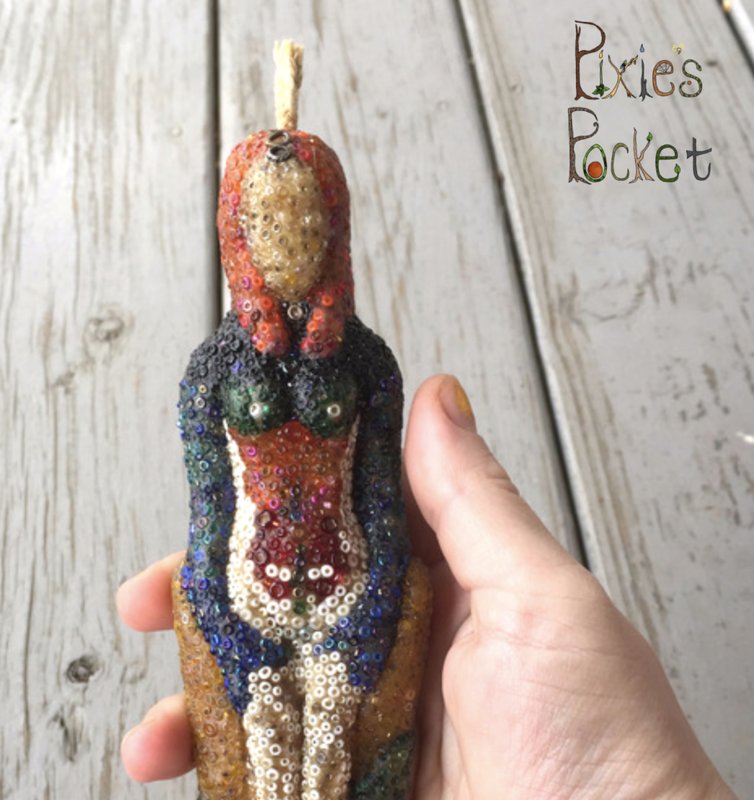 Visit pixiespocket.com/community and register to join in the conversations about brewing, recipes, books, and more. It’s just been launched but we have a few active members already! If you’re as sick of social media as I am, maybe you’ll enjoy this slower-paced and more searchable medium. I love a good forum, and miss the time when they were the prevalent method of chatting online! I have been adding new products like a madwoman lately! For one, it turns out that babies are expensive creatures, even if you are a minimalist, and I’m increasing the shop creations to help with that. Also, I have a few local artisans who will be providing some wares for the shop, so keep posted. I found a stash of my art from years ago and have been scanning, editing, and getting some of them posted for purchase as prints. I started with my Orisha collage series from 2004. Check them out in the Original Art & Poetry section. 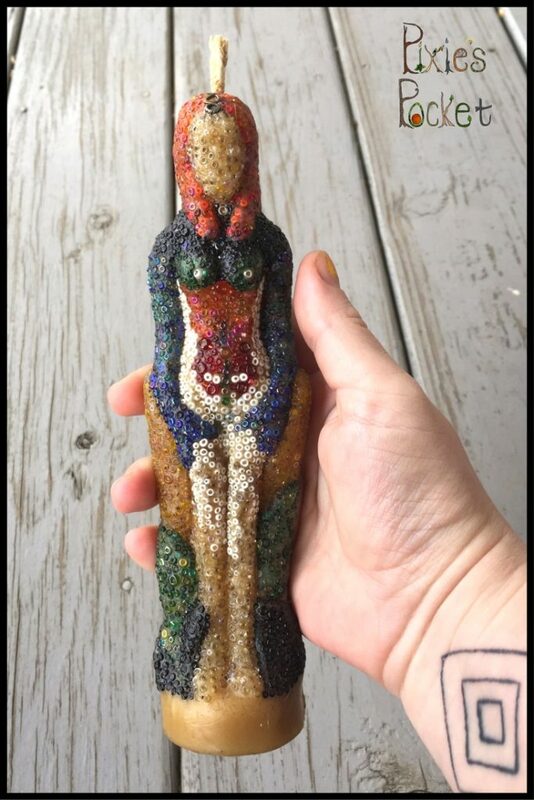 And then there’s the beaded beeswax Goddess candle – she’s listed at $250 but that is negotiable. If she looks like someone you need to have near you, let me know and we can talk! Insanely clever (ahem) items from my Zazzle store are now available to browse directly on the Pixie’s Pocket site. I also list odd books and ephemera for sale on Biblio.com, if you are of the bibliophilic persuasion! Thank you, dear reader, for being here, for being engaged, and for helping me feel less alone in this crazy world. I appreciate you, and look forward to chatting with you in the forums!